Sometimes people experience lingering pain from a stubborn muscle that does not respond to other forms of treatment. In order to eliminate this pain, physical therapists have been known to use a technique called dry needling (DN) . 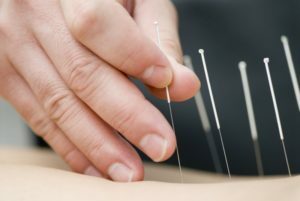 Dry needling is one of the modern techniques that are used by medical professionals to alleviate pain in which their patients are experiencing. The philosophy and goals of dry needling is different from the Chinese traditional method known as acupuncture. Where acupuncture may be seeking to affect a person’s Qi, or energy flow, dry needling seeks to reduce muscular pain (sometimes called “trigger points” or “knots”) by releasing tension and muscle spasm, as well as reduce local inflammation and decrease chronic pain. If you notice physical therapy is not working effectively in relieving that back pain, headaches, and migraines, it’s time to visit Oklahoma Physical Therapy to try this technique. Our expert physical therapists will easily identify the trigger point or the muscle and release it using the dry needle. Dry needling definitely requires well-trained physical therapists. We have trained and experienced physical therapists at Oklahoma Physical Therapy who perform this technique with care to relieve pain. The physical therapist will meet one-on-one with you to identify the trigger point(s) and effectively alleviate your pain with trigger point dry needle. contact us today to make an appointment with one of our trained therapists.